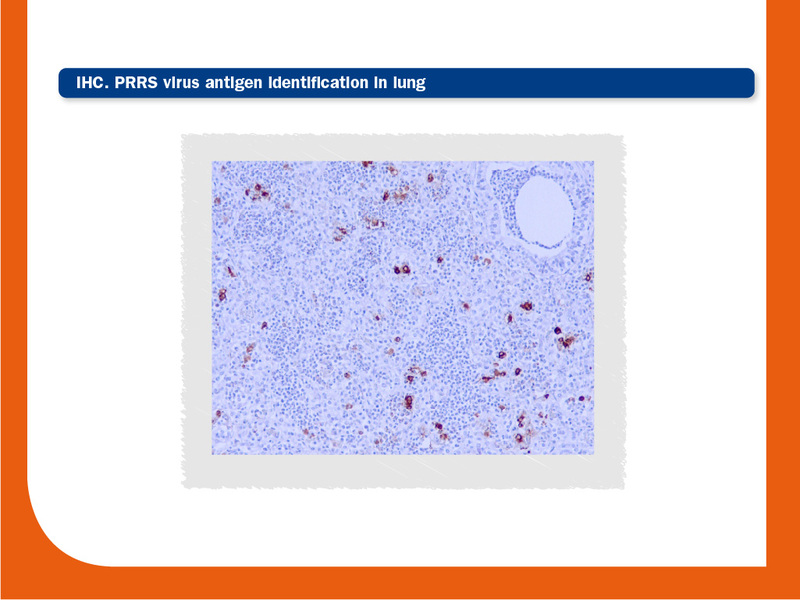 Identification of PRRS virus can be accomplished by the detection of viral proteins (antigen), by virus isolation and by the detection of nucleic acids. PRRS virus antigen or nucleic acid can be detected in tissues by IHC and ISH, respectively. The relationship between viral detection and lesions can be established by a combination of IHC or ISH and histopathology. 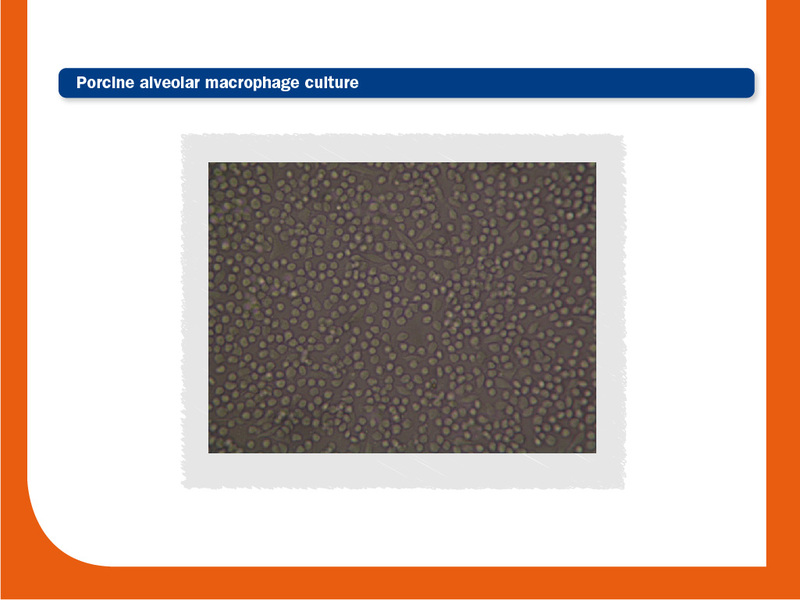 Whereas PRRSV2 strains can be isolated in both porcine alveolar macrophages and sublines of the African monkey kidney cell line (CL-2621 and MARC-145), some PRRSV1 and European-like viruses can only be isolated in porcine alveolar macrophages. Since cytopathic effects, which occur in 1-4 days, are not always clear, virus isolation usually needs to be confirmed by RT-PCR, IPMA or IFA (maximum sensitivity at 7 days). Virus titration can be done using serial dilutions of sample. It involves ORF5 digestion by three restriction enzymes. As a result, a three-digit pattern is generated. This technique is used to differentiate isolates, however it has been demonstrated that different isolates can share similar RFLP patterns. Therefore, sequencing is better than RFLP to differentiate isolates. RT-PCR, together with ELISA, is the most commonly performed diagnostic test for PRRS. It is based on the detection and the amplification of a specific segment of the genome. It is more sensitive than virus isolation, but since it detects the genome, a positive result RT-PCR does not imply the presence of viable virus. RT-PCR is usually used to amplify ORF5 and ORF7 regions. Its sensitivity is variable since the genetic diversity of the virus is in a continuous ever-expanding mode; this phenomenon require a constant updating of the primers used in order to minimize the presence of false negative results. It is based on the detection, the amplification and the quantification of a specific segment of the genome. It detects and measures the amplification of a targeted segment during each cycle of a PCR reaction in real-time, and not at its end, as in conventional RT-PCR. Briefly, oligonucleotides labelled with a fluorescent reporter permits detection after hybridization of the probe with its complementary sequence. 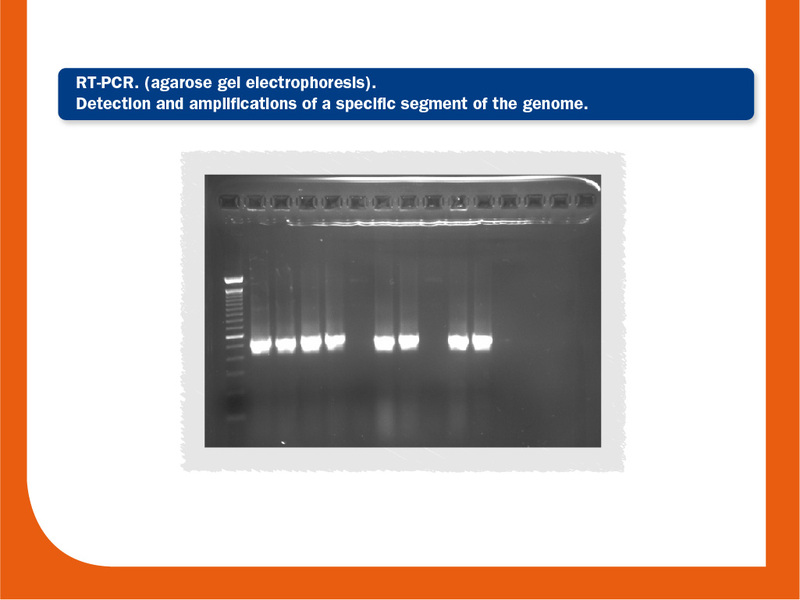 A real time RT-PCR instrument is responsible to measure the accumulation of the fluorescent signal during amplification. A relative (semi-quantification) or absolute quantification of the targeted segment can be performed. When an exact quantification is needed, a standard line from serial dilutions of the same strain that we intend to detect is mandatory. RT-PCR results are usually shown as Ct values. Ct value is inverse to the amount of nucleic acid that is present in the sample. It can be exactly (absolute quantification) or approximately (semi-quantification) correlated to the number of copies in the sample. Therefore, lower Ct values indicate high amounts, while higher Ct values mean low amounts of the targeted nucleic acid. For PRRS virus infections, typical Ct values are around 26 cycles, with a significant variability depending on the age of the animal; i.e. Ct values around 17-18 cycles can be found in some new-born viremic piglets, whereas highest Ct values -around 26- can be found in adults. In general, Ct values ≥ 37 cycles are considered as results with a relative low or null biological significance. Viraemias due to vaccinations with attenuated virus usually range from 30 to 35, depending on the strain and on the age of the animal. 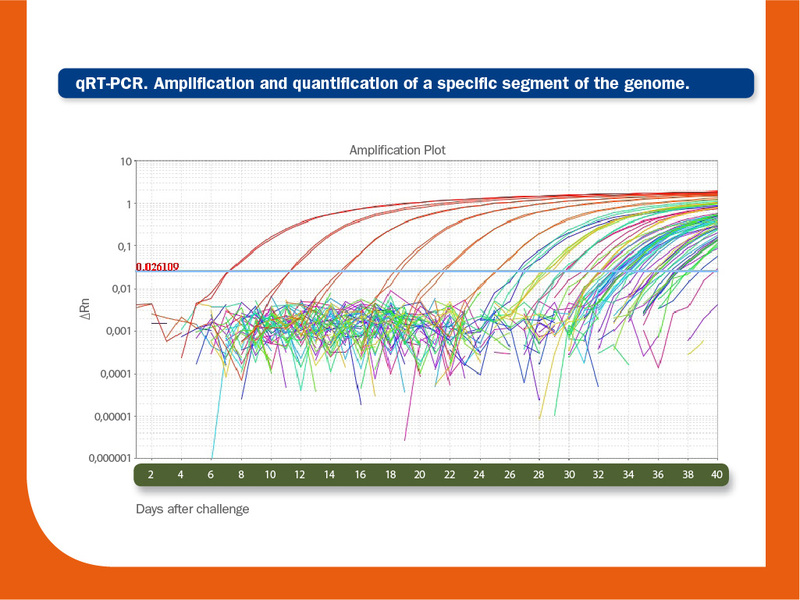 As occurs with conventional RT-PCR, there is a lack of uniform assay performance among labs. At present, commercial real time RT-PCR assays are available in some countries, but in some labs it is a home-made assay. Similarly to conventional RT-PCR, a variable number of false negatives could exist; usually depending on the standardizing, improving and updating of the assay and on the expertise of the lab. Nevertheless, sensitivity is similar or slightly higher than conventional RT-PCR, but again relies on the matching of primers and proves to the target sequences. Obviously, it can be designed to distinguish species.